We provide an excellent florist service to Beechworth and surrounding districts. Franca has over 30 years experience as a Florist so you know you will get the right flowers for any occasion. Our close proximity to Beechworth enables us to deliver a vast range of beautiful arrangements. You know they will arrive looking beautiful and fresh – ‘just cut’. We pride ourselves as wedding specialists and can design & create unique bridal bouquets and displays for your special day. We are happy to supply your needs in Beechworth and surrounding areas. With a wonderful selection and lots of ideas, contact us to make your wedding day special. You can add to your floral order with helium balloons, party & novelty items, teddy bears. We also stock a large range of fresh & silk flowers, Mor bath, body & lifestyle products and ME Collection wedding charms. Our Funerals tributes are made to order and we can arrange for them to be delivered locally or Australia wide. Hampers? Yes, we custom make all sorts including fruit, chocolates, wine, floral and mixed. 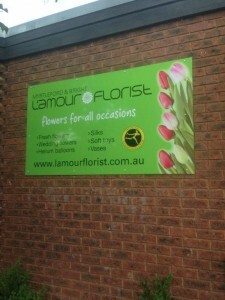 Just call and ask Franca at Myrtleford / Beechworth Florists – L’Amour Florist. Contact us for all enquiries including same day delivery.